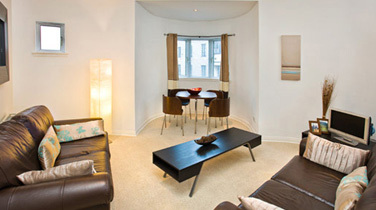 This lovely apartment, with parking space, is situated just off the famous Royal Mile, near the Scottish Parliament. Recently refurbished, this ground floor apartment has been designed, furnished and equipped to a high standard to ensure a comfortable and enjoyable stay. With a spacious master bedroom and ensuite, cosy second double bedroom, second bathroom with large soaker bath, comfortable living room with dining area and spacious, fully equipped kitchen, this apartment is well situated for many of Edinburgh’s famous attractions, including the Palace of Holyrood House, Our Dynamic Earth and Edinburgh Castle.